Home Whitening vs In-Office Whitening. What's best for you? What Are the Active Ingredients in Whitening Products? All whitening agents use a peroxide solution. Whitening agents vary according to the strength of their peroxide content. A mild whitening agent may have as little as 10% peroxide while a much stronger teeth whitener could contain as much as 40% peroxide solution. Over-the-counter whitening products from stores, such as whitening strips, are the mildest whiteners with the lowest concentration of peroxide. Dentist whitening agents, including take-home whitening trays and Zoom whitening, are much stronger. How White Can Whiteners Make My Teeth? Approximately 86% of Canadians want a whiter, brighter smile, according to research from Proctor & Gamble. No matter whether you use an at-home whitening solution or book an in-office whitening procedure, the whitening agent can only make your teeth as white as your natural tooth colour. This is determined by the thickness of your enamel and how yellow the dentine is underneath it. Whiteners can remove food, coffee, and wine stains from your teeth’s enamel, but they can’t stop yellowed dentine from showing through thin enamel. As store-bought whitening agents contain the least amount of peroxide, they will not whiten your teeth as effectively as dentist-endorsed whitening agents. Store-bought whitening agents can lighten your teeth, but they’ll take a much longer time to take effect. Will Whitening Products Improve My Whole Smile? Store-bought whitening strips are like small band-aids that stick to your teeth. Due to their size and design, they usually only whiten the front teeth. Most patients smile wide enough to show more than these teeth, so they may notice store-bought products don’t provide the even, white smile they’d hoped for. In contrast, dentist whitening products whiten the whole smile. At-home whitening trays are like mouth guards made from flexible material. They’re filled with a gel solution and patients wear them daily for approximately an hour for a period of seven to 10 days. The gel solution coats the side teeth as effectively as the front teeth, creating a much more cohesive white smile. Zoom whitening is another great full-mouth whitening solution. A dentist or dental assistant applies a hydrogen peroxide gel directly to the teeth then shines a Zoom light on the teeth. The light and the gel work in tandem to whiten all the teeth. How Much Do Whitening Treatments Cost? Store-bought whitening treatments are very affordable, with a month’s supply of whitening strips costing around $50, depending on the brand and retailer. In contrast, whitening treatments from dentists can cost between $300 and $800. At-home whitening trays are the most affordable option from your dentist. Zoom whitening is more expensive. Many dentists suggest using Zoom whitening and at-home whitening trays together for the most effective whitening solution, although it will also be the most expensive. Do Whitening Products Cause Side Effects? All whitening products can make teeth more sensitive for the treatment period. As store-bought whitening products are milder than in-office whiteners, they don’t make teeth as sensitive. While they don’t work as efficiently, they may be the best option for patients already struggling with teeth sensitivity. 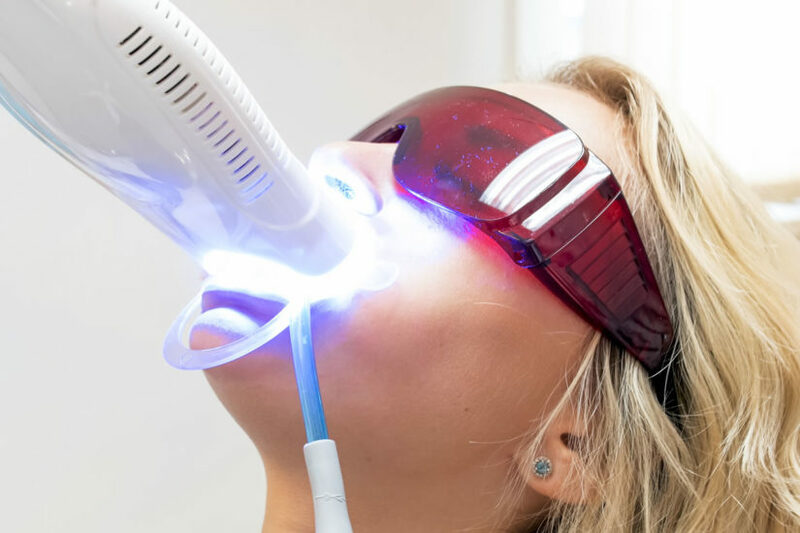 Some dentists recommend starting with store-bought whiteners, then moving to take-home whitening solutions or in-office whitening treatments if they feel comfortable. Dentists can control the amount of peroxide in the gel solutions for take-home whitening trays. This allows them to tailor a whitening solution for their patients’ sensitivity levels. Zoom whitening uses the strongest gel solution, as it must work in a much shorter time period. This strong solution may be unbearable for people with sensitive teeth, even though dentists apply a sensitivity-reducing gel to soothe teeth after the procedure. Note that after the treatment period, the sensitivity people often feel while whitening their teeth quickly subsides. During the treatment period, you may like to avoid extremely hot or extremely cold foods and beverages, which can trigger sensitivity. You could also brush with a toothpaste designed for sensitive teeth. Since whitening agents contain peroxide, they can irritate and burn gums. Consumers may burn themselves if they expose their gums to store-bought whiteners. These burns should be minor and will heal, but they can be unpleasant. Dentists who are experienced with whitening can teach their patients how to use the at-home whitening trays so burns don’t occur. As the dentist administers Zoom whitening, burns are rare with that method. So long as you buy products approved by Health Canada, they should be safe for use at home and not cause any unusual side effects. What About Other Whitening Dental Products? Whitening toothpastes, whitening mouth rinses, and whitening flosses have only minimal effect, even with sustained use. As whitening toothpastes are more abrasive than regular toothpastes, they can actually damage enamel and cause more staining. For this reason, many dentists warn against using many of these whitening dental products. Store-bought whitening products are an affordable, mild treatment option that suits people with sensitive teeth. However, if you want your teeth white fast, contact your nearest 123Dentist dental practice for a stronger in-office or take-home whitening treatment.